First strong July trade figures and then strong industrial production, both suggesting that the Malaysian economy is off to a strong start in the third quarter. The country’s GDP growth is slowing but the economy isn’t falling off a cliff. The balanced economic risks underpin our view of the Malaysian ringgit (MYR) regaining its status as an Asian outperformer once the external uncertainty lifts. Our end-year forecast for the USD/MYR rate is 4.25, revised recently from 4.35 (spot 4.14). 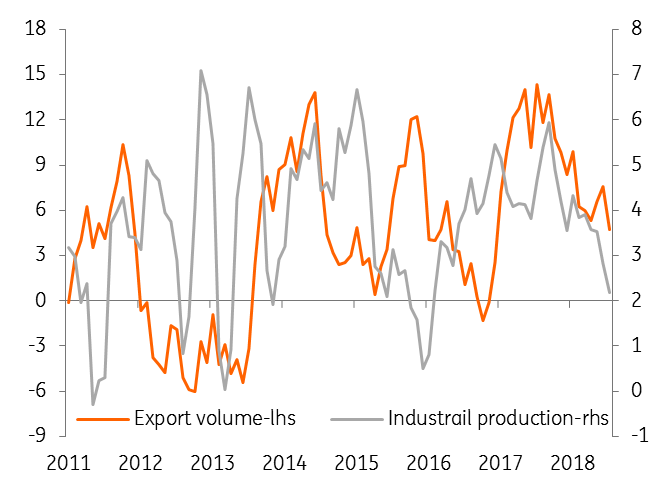 Following on from a surprisingly strong export performance in July, industrial production grew by 2.6% year-on-year in that month, surpassing the consensus estimate of 1.4%. The acceleration from 1.1% growth rate in June comes as faster export growth boosted manufacturing, while utility growth also quickened and mining posted the smallest decline in three months. Among other manufacturing indicators including sales, employment in the sector and wages, all were firm. The manufacturing sales growth of 9.6% was the fastest since January. So was the productivity growth as implied by growth in sales per employee of 7.6%. Both exports and production growth are slowing on a trend basis (see figure), which will be associated with the slowdown in GDP growth. However, a sharp GDP slowdown in 2Q18 to 4.5% from 5.4% in the previous quarter was partly a function of the high base-year effect. With the base effect continuing in play in the remainder of the year, we expect GDP growth to settle around 4% in the second half of the year, for a full-year average growth of 4.5%. The commodity currencies have started to feel the heat in the recent emerging market currency sell-off. The MYR isn’t spared with a 1.3% depreciation since mid-August, shifting it from being an Asian outperformer to one of the underperformers. Besides emerging market contagion, PM Mahathir’s rhetoric against foreign investors should have added to the currency weakness. The central bank (BNM) seems to be accommodating the MYR weakening pressure as long as it’s from external factors, while the currency enjoys decent support from the trade and current account surpluses. We view economic risks as balanced and see no need for any central bank policy support, either for the economy or for the currency.